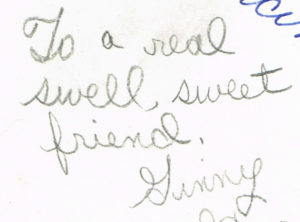 In 1969 Ginny wrote in my seventh grade yearbook, “To a real swell, sweet friend.” I don’t remember what I wrote in hers, but I assume it was something equally nice. We went our separate ways after high school graduation, but reconnected via Facebook. I was devastated when I learned from Facebook that she had breast cancer. I was elated when I later I learned on Facebook that she had beaten it. I attended our high school 40th reunion via Skype, and she was one of the classmates I most enjoyed catching up with. Most of my Facebook posts are of my cartoons. When I post something political, it’s left winged. Most of Ginny’s Facebook posts are inspirational quotes, photos of her family, and funny videos. When Ginny posts something political, it’s right winged. It then lists 42 outrages liberals supposedly said nothing about. There were the usual things conservatives like to talk about: “You said nothing about Benghazi … Hillary’s private emails …” etc. Some things made me laugh: “You said nothing about Obama’s smoking.” Seriously? That’s really stretching things in an attempt to find fault. Ronald Regan was president in 1985 and the bomb was dropped by the police from a helicopter. If any incident points to blacks being treated unfairly by police, that was it. Some list items were about tragic events that happened under Obama. 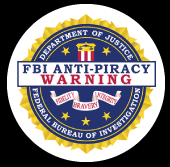 For example: Operation Fast and Furious. That was a terrible tragedy and I believe there are no justifiable excuses for the fiasco that left one border agent dead after being shot with a gun that was part of an ATF operation. I am willing to criticize Obama. Obama was also willing to take criticism and admit mistakes. I have never once heard Trump admit he was wrong about anything. That’s one of the things I find most disturbing about him. One of the things I find most disturbing about his supporters is that whenever Trump says or does something that most of the public finds outrageous, his supporters, Ginny included, bend themselves into pretzels finding ways to justify his words and actions. Ginny: “I see it all right here. I don’t understand what you’re saying at all. I’d like a list of all the atrocious things that you say have happened under President Trump. And what does he have to do with conquering and seizing lands? The thread was deleted from Ginny’s time line before I had a chance to tell her that one of the most atrocious things that has happened under Trump is that people have no qualms about being openly racist. 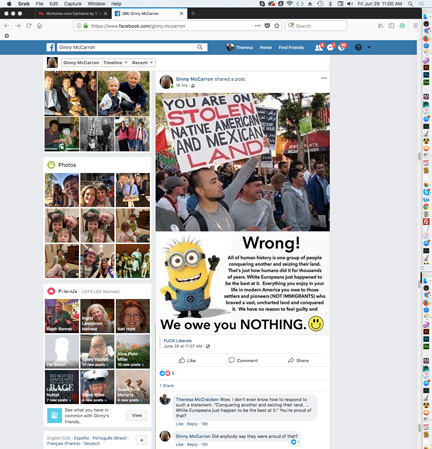 Ginny, you may not believe the post with the minion was blatantly racist, but it was. I care about you and wish you and yours nothing but the best, but you have lost my respect. That may not climb to the level of being atrocious, but–to use one of Trump’s favorite words–it’s sad. Screen shot of the whole bizarre Facebook Exchange. I posted on Ginny’s Facebook page a link and said, “I wrote a blog post about us.” I was surprised when a bit later she clicked the “Like” button. I had been really conflicted about writing this post because Ginny was one of my best friends in high school and I didn’t want to hurt her. This post started as a letter I began on January 20, 2017. Ginny changed her Facebook photo that day to a picture of Trump’s inauguration. I spent much of that day feeling nauseous. I worked on the letter/post on and off since then: writing it, rewriting it, dragging it to the trash, dragging it out of the trash, wondering why I was bothering writing it, wondering whether Ginny would bother reading it, wondering if anyone would bother reading it, and if anyone read it, would it change anyone’s opinions. What I really wanted to know was how two decent, intelligent, kind people who grew up together in East Lansing, Michigan could have such dramatically different views of the Trump presidency? One of us must be terribly misinformed and/or terribly wrong. After Ginny clicked the like button I wondered if she’d actually read the post. Nuts is right. 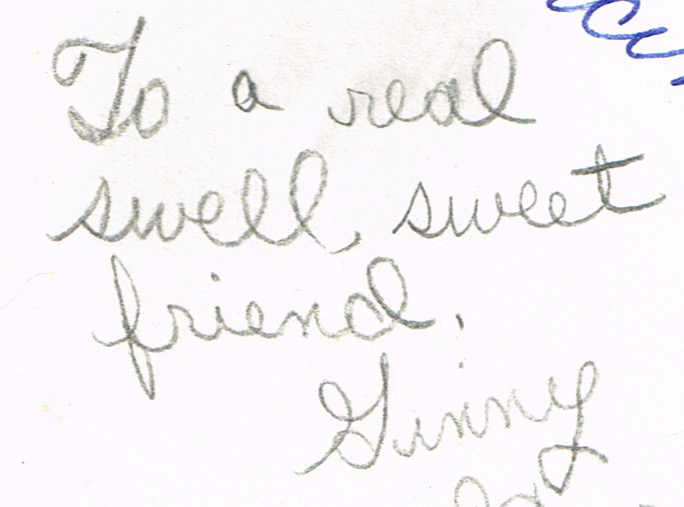 I have no idea how to respond to this except to wish Ginny well. “What I really wanted to know was how two decent, intelligent, kind people who grew up together in East Lansing, Michigan could have such dramatically different views of the Trump presidency? One of us must be terribly misinformed and/or terribly wrong.“ This mystifies me most of all. A cherished friend has long been much more conservative, but we didn’t have to talk politics until 2016. We agreed not to, but I could feel a different tension. A couple texts more and his climate change denial stance was revealed. OMG. This from someone whose career is in a field that sees first hand effects of our new random weather patterns that don’t match past years records. Changing are visible from satellites!! That was the last straw. I feel like all our classmates that started here and ended up there are broken. Sad. So very sad. However I just saw Michael Moore on The Late Show with Steven Colbert. One fact he goes back to, and wanted those watching to know, is that of the last 7 presidential elections, the Democratic candidate has won the popular vote 6 TIMES. His point being that it is not a majority electing Republicans. That is not who most of us seek as a leader. It is who the Electoral college and gerrymandering put into office. Two entirely separate things. Have heart. If the majority act on their true will, we can prevail. “If the majority act on their true will, we can prevail.” That’s the thing. The misinformed are the ones who vote.